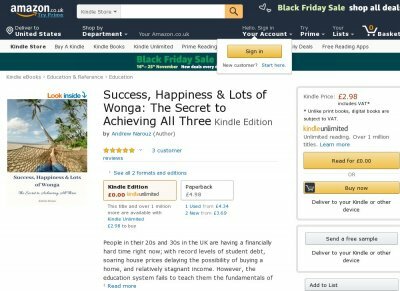 In this book, Andrew Narouz, the UKs trusted financial planner for millennials, goes through the proven method that he has found helps millennials make the most of their money so that they can maximise their happiness and success in life. Through his secret goals-based investment approach, Narouz explains how to make your money go further so that you do not have to sacrifice your happiness in the short term in order to achieve your long-term goals. It is a simple approach that anyone can understand and use, but the key is to start using the system as early as possible. Narouz also explains how to budget for, and save money on, some of the biggest financial goals you will come across in your life. By listing useful websites and apps, while giving you valuable information, this book is bound to save you money and make it easier for you to make some of lifes biggest financial decisions.